Rules, directions and how to play jacks. Variations included. Teach your children how to play the fun game of Jacks with these great variations from the past. Remember Cherries in a Basket, or Over the Fence? What you need to play jacks: Set of jacks and ball. Smooth surface to play on. Set up the game: Begin by throwing your jacks onto the ground in front of you. Try and make the jacks land not too far apart or too close together. 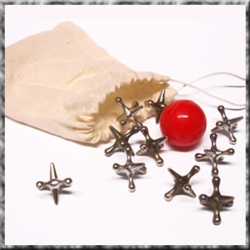 Playing Jacks: You then throw the ball into the air … pick up one jack … then catch the ball after it bounces one time. Continue picking up the jacks one at a time. When you have collected all the jacks, throw them again and start picking the jacks up two at a time (twosies). When you get to threesies you have to pick up the three sets of three first, then pick up the left over jack. Continue on until you are at tensies. You can then declare the winner as the first one to tens, or go back down again to onesies. Your turn continues until you either: miss the ball, fail to pick up the jacks, move a jack, or drop a jack that you have picked up. Your turn is then over and the next person goes. Kissies - If after you throw the jacks and two (or more) jacks are touching you can either leave them, or pick up the jacks and drop them to spread them out. Who goes first: Throw the jacks up in the air and trying to catch as many as possible with both hands together ( your palms have to be face down - thumb to thumb). Whoever catches the most jacks goes first. You have to play from ones to tens without missing. If you miss then you have to start again at ones. Cup your hand and throw the ball with the opposite hand. You have to then place the jacks in your cupped hand - one through tens. Place your hand slightly cupped on the ground with the side of your hand resting on the ground. Then throw the ball with the opposite hand and slide the jacks into the “pig pen” ones through tens. Place you hand on the ground straight and you have to place the jacks on the other side of the “fence” - ones through tens. After you throw the ball you have to make a circle in the air around the ball before it bounces - one to tens.